Italy coach Roberto Mancini said Monday he overlooked Mario Balotelli for upcoming Euro 2020 qualifiers because the Marseille player lacked fitness. Balotelli's positive start at Marseille with five goals in seven starts has not convinced Mancini, nor has the performance of Andrea Belotti, 25, who has scored ten league goals for Torino. 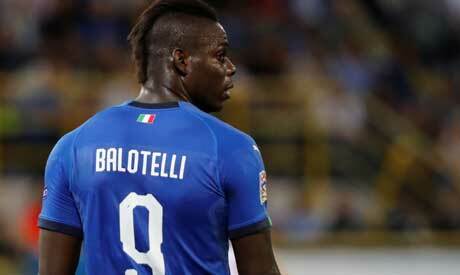 "Mario is not yet in optimal condition to play for the national team," Mancini. "He has improved physically compared to September but can still improve. From him I expect a lot, he's nearly 29 years-old, he's at his peak, and for the national team he must give the maximum." "The beauty of the national team is that everyone can express their opinion," said former Manchester City coach of his decision to overlook the two forwards. "I make my choices, Belotti is like the others who have stayed at home this time, he can do much better and return to the national team. He is young, he is improving in the league, he will surely be able to come back "
Veteran striker Fabio Quagliarella was recalled at 36 years as he leads the Serie A goal scorers chart with 21 efforts in 28 games. "I called up a few more players because I didn't really know everyone's condition and wanted to get to know them and evaluate them better," continued Mancini. "We called up a few more strikers because we have to work in this sense. I'm sorry for those who were left out. "We have young players who are improving. We thank (Under-21 coach Luigi) Di Biagio because we took several of his players for the European Championship away from him. "Zaniolo can surely debut for us. Kean? Moise has won so much for his age. Let's hope he starts like Balotelli did, which is very good. "I'm confident. Our games coming up project us towards the European Championship, so we must do well in them. "We have lots of good players, now the bar needs raising. Jorginho is playing well. "Chelsea are having problems, but he's missed hardly any matches. The same goes for (Marco) Verratti."